Which is the best world record? Or, for recreational athletes, which is your best race performance, given that they are at different distances? Athletics world records can be used to compare athletic performances, at all levels. We fit a model to these which describes change in performance with distance of the race. The basic assumption is that the best times in the world close to the world records are equally good. By looking at the residuals from this model, we can find which records appear to be better. The model can then be used to compare races at any distance, whether these were at 100% of the average world record performance, or anywhere below this. A brief summary of these ideas is given below. Track and Field calculator 2014 using 2014 WMA factors. Race Pace calculator - computes actual splits from race times. Excel spreadsheet and VBA functions only with performance calculations (including age-group world records). Age-grading - compares age-group world records and WAVA factors. Swimming records show a similar pattern and a simple model gives us the average benefit gained from turning at each end of the pool. Data - includes original record data, spreadsheets with calculations/models, tables of equivalent performances and links to athletics sites. For more details of the models see the paper: Models for comparing athletic performances. (PDF) (The Statistician, 1998, 47, 509-521). 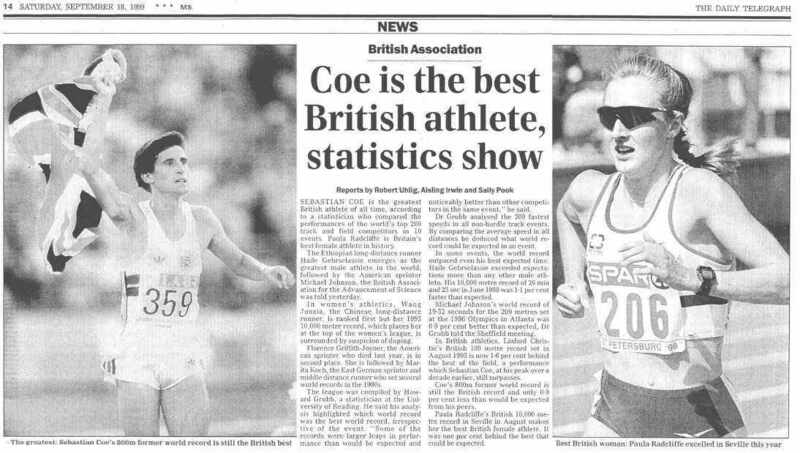 Calculating Championship Performances - article in The Fellrunner magazine, February 1999. The key to comparing race performances at different distances is to use the speed of each performance, since we know that it will take at least twice as long to run twice as far - see Figure 1 and Figure 2 below, which show a strong, but irrelevant, correlation between time and distance, whether on a linear, or logarithmic scale. Looking instead at speed - Figure 3 - we see the slowing with increasing distance, as we expect. Modelling this slowing gives us the performance curve. This can then be used to compare performances at different distances, for the world record, and individual, performances. Speed contains more of the interesting variation between distances than time, which is swamped by the difference in distances. Figure 4 shows the performance curve for the world 8th best times, which is smoother than that for the world records - we use these and other quantiles from the best times to estimate a smooth curve at world-record level. The model fitted to WR (and world-class) speeds in Figure 3 allows us to compare performances at different distances - comparable performances lie on the curve, or e.g. a fixed % of it (slower than the WRs). For an individual athlete, we compute the % of WR speed which they achieve at any distance. This gives us a distance-independent measure of performance (see the tables of equivalent times for men and women as constant %ages of WR speed, and the race performance calculator). Thus, your best race is the one with the highest %WR(speed) and to predict races at different distances you could assume that you might run them at the same %WR(speed) as other races. By looking at how the WRs have changed through the years - times in Figure 5 and speeds in Figure 6 - we can estimate an average improvement in WR performances. Figure 7 shows how one of the parameters of the model for speed (in Figure 3) varies through the years. This parameter determines the shape of the performance curve. Figure 8 shows how the other parameter varies - this determines the overall position of the speed curve - i.e. on average, all WRs have been getting faster (obviously), but the rate of increase gives a clue to future WR progression.